This is a dressy watch with a very attractive silver-toned bracelet. It has a stainless steel band, case and bezel. The dial is dark blue (it looks black in the picture). It's dressy enough for a suit, and fine for everyday use. Hey, this is more than a piece of jewelry - it's a precision timepiece with Japanese quartz movement! 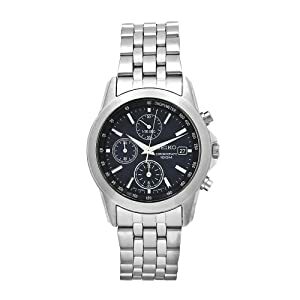 It's also a chronograph (stopwatch). It's water resistant to 100 meters (330 feet), so it can get wet and still work fine. The calendar shows the date at the 3 position.